A normal route or normal way (French: Voie Normale; German: Normalweg) is the most frequently used route for ascending and descending a mountain peak. It is usually the simplest route. the simplest route is less well known than the normal route (Watzmannfrau). the technically easiest route is more arduous than another (e.g. due to rubble) and is therefore mainly used on the descent (Hochkalter). the technically easiest route carries a much higher risk of e.g. 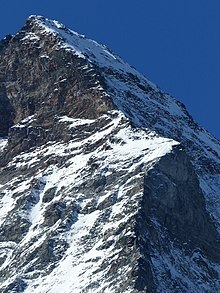 rockfalls or avalanche and is therefore avoided in favour of a more difficult route (Watzespitze). the technically easier route requires a complicated or long approach march, or all access may be banned via one country (Mount Everest). The term tourist route may sometimes be applied (irrespective of the level of difficulty of ascent) by those wishing to suggest that other routes up a mountain are somehow more "worthy". This belittling of the "normal route" therefore maintains a distinction between those perceiving themselves as serious mountaineers who disparage the incursion of tourist climbers into their domain (hence the term the "Yak Route" on Mount Everest). ^ "How to climb the Matterhorn". www.thebmc.co.uk. Retrieved 2018-12-27. ^ The Mountain Encyclopedia" by Frederic Hartemann and Robert Hauptman (2005). Accessed on 1 Jun 2014. ^ Perkins, Andy. "BMG Route Card: Voie Normale - Piz Buin". www.ukclimbing.com. Retrieved 3 March 2016. ^ Musa, Ghazali; Higham, James; Thompson- Carr, Anna (June 2015). Mountaineering Tourism. Routledge. p. 52. ISBN 9781317668749. Retrieved 3 March 2016.